This page is where I copy and paste the emails I get from students who take the time to write in and say thanks for all my hard work. Actually I made this website because I want to be a BILLIONAIRE but getting an email is nice, too! Seriously though, people don't trust things they read on the internet so if you find this website was useful, please write and let me know. Those emails have two uses. It makes me happy. I normally read them aloud to my girlfriend and she rolls her eyes at how smug I am. It might convince someone who finds this website that the tips are useful and they should pay attention. Message: As a teacher, I just want to say that your website is by far the best website I have seen to date. Well done!!!! “I have really good news! I passed the exam! Once again thank you very much for your advice on your website! Message: Hi! I've just found out I got an A in my CAE exam and wanted to thank you very much for all the helpful tips. 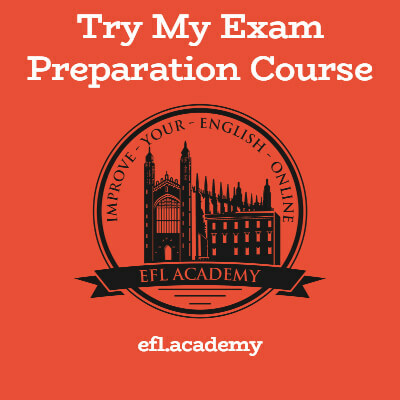 I found this website only two days before the exam, but I was able to get a better understanding of the Speaking Test requirements thanks to the videos you made. I also used the order you recommended for the Reading and Use of English sections, which really saved me a lot of time. So thank you again and know that your website is making a big difference. Message: Hi! I passed my exam this month and I want to let you know that your website has helped me immensely!!!! :) In fact it gave me much more than quite expensive preparation course :D I recommend it to everyone who asks me about it. I just got the result today that I passed my CPE exam! :-) So I want to thank you for having this wonderful website!! I spent lots of time on this site in the last few weeks and I'm attributing a big part of my success to you. So cheers and keep up the good work! “Message: I got my CAE exam results just a few days ago; I passed! I couldn’t be happier! What’s more, I scored an A on the reading part thanks to Your advise on time management. Message: Hello, I am a student from Czech Republic and I would like to thank you very much for the ‘caeexamtips’ website you have created. I took the CAE exam few days ago and, despite the fact that I do not know the results yet, I must say that your recommendations and pieces of advice had helped me significantly whether in the speaking or in the reading part. “I loved the website! It includes every answer to those stupid questions we all make in our head and we dont know where to seek for the answer. Message: Thank you so much for your work, which I find extremely helpful. I am an English teacher preparing a student for the CAE test, and I couldn't remember how to tackle Listening paper 4. I find ALL of your tips absolutely GORGEOUS. Thank you again for such an extensive, interesting and rewarding piece of work. Message: Thank you very much for having the opportunity to read your website, is great and it is very well done!! 10 points!! “I’ve recently taken over a student who is taking an Advanced exam this Saturday. This morning he was telling me about a great site that had helped him a lot with tips and strategies. I checked the site and found out you are the person behind it! “Tomorrow I am going to take an exam based on the same criteria as CAE. I have read through your pieces of advice and it was really useful! Message: Dear Andrew, you have been my best friend for the last months (lucky me!). I followed all your tips and passed my CAE exam! Thank you very much for your great job.